The Morgan Plus Four Super Sports sports car was down to the skills of Chris Lawrence, whose Morgan Plus 4 was very successful in the 1959 UK Race Season. In 1962, his competition successes came to the notice of Peter Morgan, who offered him Morgan works support. As a result, he won his Class in the 1962 Le Mans 24 hour race. Under the name Lawrencetune, he prepared engines for Morgan when specially ordered. The Lawrencetune Morgan Super Sports used the aluminium low-line bodies prepared specially for Le Mans. However, prior to low-line Super Sport production, a number of hybrid Plus 4's were produced with the original steel high-line bodies, coupled with aluminium wings, and Lawrencetune engines. These are now a highly sought after models. During the period mid 1950's to early 1960's, the Morgan Plus 4 was powered by a series of Triumph TR engines and gearboxes. In 1960, Morgan teamed up with Lawrencetune, who modified the engines of a small number of Plus 4's which were entered into various endurance events, including the Le Mans. Since it was not unusual for these modified cars to secure at least Class wins, they duly created interest amongst the sports car fraternity to encourage Morgan to produce equivalent modified Plus 4's. Hence the birth of the Plus 4 Super Sports. The two seater Super Sports were produced in one of two body styles - either the high body or low body versions. Early models made use of the high-line bodies from the Plus 4, whilst later models used the low-line bodies from the 4/4. In 1962, a Lawrence tuned Plus 4 secured Morgan's finest success at Le Mans, where it was a Class winner. As a result, it became the prototype of the Super Sports, which featured a lighter, low-line aluminium body, and a more powerful 125 bhp engine derived from a modified 92 bhp TR2 unit. These cars were distinctive with their bonnet scoop, which was necessary due to the cars' two twin choke Webber carburettors. 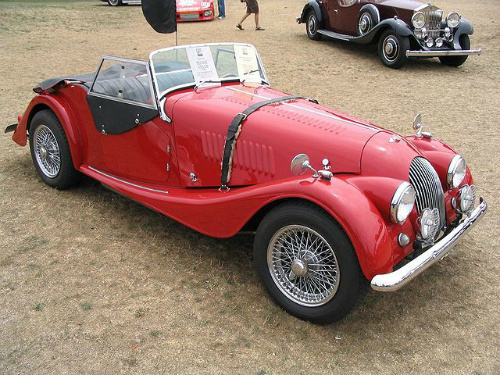 During the period 1961 to 1968, a total of 104 Morgan Plus 4's were modified to achieve the Super Sports specification. Of these, 95 were two seaters built for racing and competitions primarily in the US. Furthermore, 50 of these cars were built as convertibles. With a top speed of nearly 120 mph, they were not only high performance cars, but also well suited to competitions. A unique example of this car was known as the Baby Doll, and was famous in Morgan folklore. It was specially ordered, in early 1962, by Lew Spencer, a Morgan dealer and noted SCCA (Sports Car Club of America) member. This was his personal Morgan race car, in which he subsequently won the 1962 SCCA C Class National Championship. The Baby Doll was renowned for the fact that it regularly beat Corvettes, Porsches, and E-Types, even though it sported a smaller engine than its competitors. It has been suggested that the Plus Four Super Sports offered what was probably the best value performance car on the market at that time. It had precise handling, with a body styling that took one back to the classic cars of the 1930's. The Super Sports is the most desirable Morgan performance car owing to its competition successes in a number of major international races, combined with its limited production.